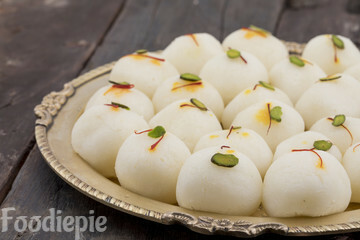 Rasgulla - Fusion dishes are one such that adds elements of different culinary traditions. This type of cuisine has not been classified according to any particular dishes style and has participated in many innovations.Fusion is a general term for combining various forms of food cookery and comes in many forms.A melt in the mouth soft and spongy cheese balls in light and sweet mild cardamom flavored sugary syrup. This is easy and traditional to make Bengali sweet that you cannot go wrong with it.Let's check out recipe first. Step 1 : Remove cream or cream from milk first. After this, put it on a light flame and boil it once. Then add lemon juice in it. Play light. Step 2 : When milk comes roling boil,add water,lemon juice and stir continuously using spatula.Solid milk portion and whey liquid will begin separates completely within 5 minutes.Turn of the flame. Step 3: Spread a cheese cloth over large strainer or colander and transfer over it drain the whey.Rinse it in running water to remove lemony taste into cheese. Step 4 : Drain water and tie chhena in a clean cloth and press it gently for remove the excess water.After that hant it on huk for at least 45 minutes.no more than 50 minutes for better moisture. Step 5 : Untie the Cloth and transfer chhena to plate.Crumble it with hand.It should be crumbly and little moist.if it is too dry then rasgulla will turns harder and if it too soft then it will cracked while cooking. Step 6 :Knead it all and make smooth dough until it release fat.if your palm will turn little greasy it is indication to start releasing fat.Stop kneading after that. Step 7 : Making balls from dough .Do not make large balls because it will increase size while cooking in syrup. Step 8 : Heat 1/2 cup of sugar with 4 cups water and cardamom pods in large broad vessel over medium flame and making sugar syrup.When it comes rolling boil then gently drop prepared balls in it. Step 9 : Cover it with lid and cook o medium flame.if you are using pressure cooker only put the lid over cooker.Do not use whistles.After about 5 minutes.remove the lid and stir gently with spatula.cover it again with lid and let it boil over medium flame for 7-8 minutes. Step 10 : Turn of the flame.you will notice that rasgulla size increased double.They will shrink little after turning of flame but it normal size. Finally : Transfer them to a serving bowl and let them cool for 6 hours. Soft Juicy Rasgulla is ready for serving.